Neighbor to the area's well-known Devil's Den is the recently renovated Blue Grotto. 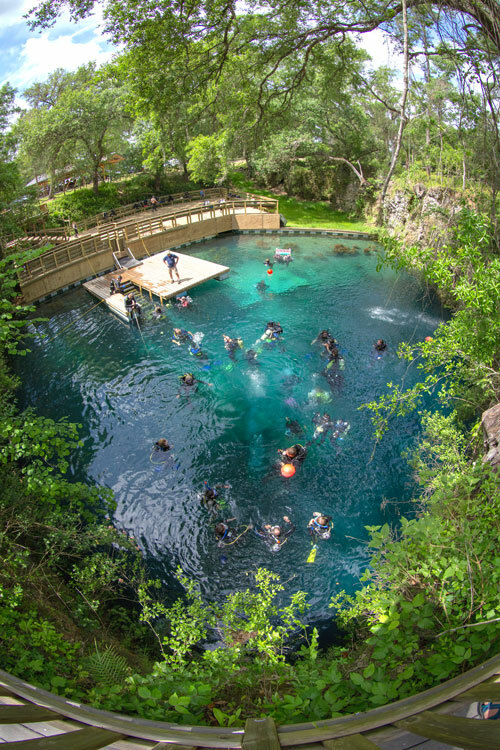 A privately-owned spring, Blue Grotto offers scuba diving and welcomes cave-certified divers. The crystal-clear waters of Blue Grotto Springs are a constant 72 degrees. It is a great place to scuba, cave-dive or take dive lessons from a professional instructor! Satisfy your adventurous side getting down deep with incredible aquatic life and underwater scenery. The Blue Grotto provides amazing views and an unforgettable experience for all daring enough to explore its depths. Entry costs are low, making it the perfect day trip for any individual traveler, couple or family. With a reservation, visitors can rent motel rooms or campsites. You can also bring a picnic lunch or run to nearby Williston for some BBQ or a sandwich.